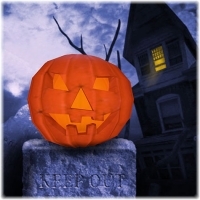 Download Halloween Pumpkin 3D Screensaver 1.02.2 - Halloween Pumpkin 3D Screensaver is our Halloween contribution to everybody. You will see a pumpkin rotating in front of a very terrific background. Mysterious landscape, churchyard, gravestone... It looks like old witches came together over here... It is Halloween!